A view from the cycle path: Dutch utility bikes are slow up hills ? The Amstel Gold Race is the largest professional cycle race in the Netherlands. 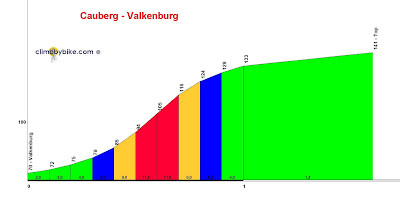 it is known to be "tough and selective, mainly because of the 31 hills that have to be climbed, some with angles as steep as 20% (Keutenberg)." At 2:15 in the video you see Michael Boogerd and the postman during the Amstel Gold Race in 2001. As ever, this proves the point that speed is in the legs, not in the bike. More on what makes for a proper reliable everyday bike - which doesn't have to be slow, and more on all those silly excuses for why cycling doesn't happen in your country, including the one about hills. Buy practical parts for bicycles at our webshop. Hah! I feel proud by association; I've been a postie (even if only on saturdays) for the past ten years, and we posties rock! I live in East London and ride a dutch Bakfiets (the two wheeled kind) and find riding up hills just a minor thing. I do have trouble buying trousers that fit my thighs though. It's a fun story and the postman sure is strong, but I have the feeling (judging by his tired face) that Michael had already done the other 30 hills. This proves more than anything that a story is not about truth, but about the fantasy of the storyteller (in this case the maker of the program Studio Sport). Try riding cargo/work bike around Wales! No, Wouter tells about the archive footage from 2001 (where you see the postie keeping up with him) that this was a training ride and the first time he ever tried to ascend the Cauberg, so no, the professional cyclist with his carbon-fibreglass-expensive doohicky bike and streamlined helmet was not halfway some race having already done the other 30 hills, but rather fresh trying this one hill for the first time with his teammates. The postie had this advantage, and this advantage only, that he had been climbing the hill every working day for some years, ie: experience and muscles. Ride in a kilt like the Scottish? Thanks. I found another version on youtube.